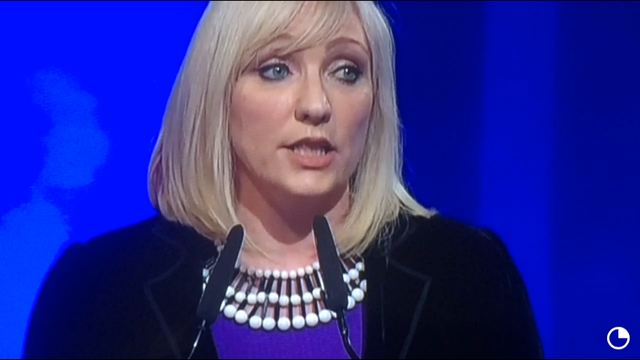 From 2000 onwards the Irish economy steadily lost its competitiveness on international markets and our economy became increasingly dependent on the domestic economy to create jobs – in particular the construction sector and public sector jobs. Between 2000 and 2007 65% of jobs growth occurred in the construction and public sectors. 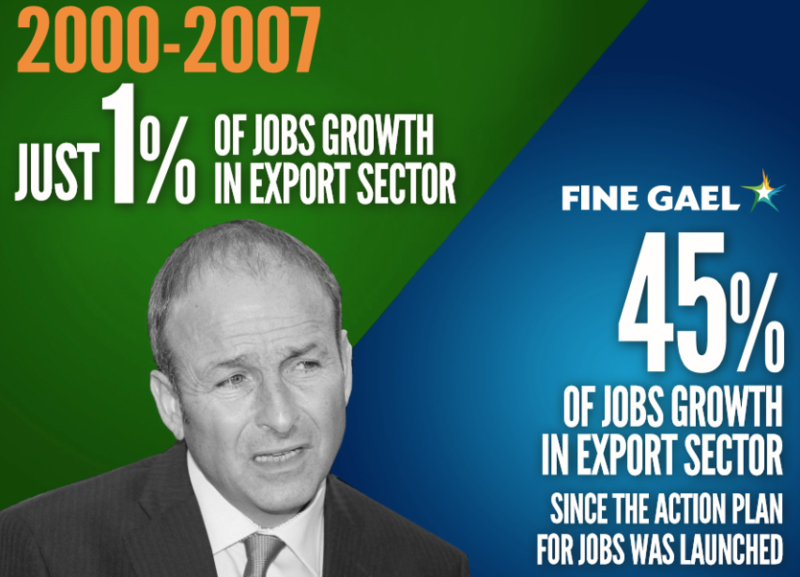 Just 1% of new jobs in this period were created in exporting companies. This huge over dependence on these sectors explains the depth and pace of our jobs crash when 300,000 jobs were lost in the years before the current Government came in to office. 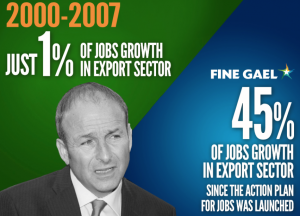 Of the 135,000 jobs created since the Action Plan for Jobs was launched 45% of them have been in our exporting companies. This is the key, structural, difference in both parties’ approaches to job creation. • Growing our tourist numbers and revenues. Enterprise Ireland companies – Irish owned – will grow exports by €10bn by 2020 by driving client companies to target new markets, and to increase the value of sales in existing markets. 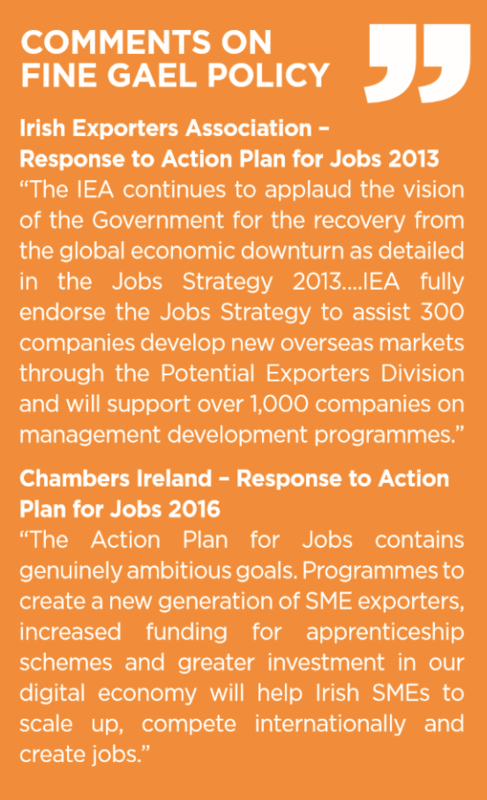 This will help grow employment in EI companies to 212,000 by 2020, a record high for Enterprise Ireland companies. IDA will generate 860 new investments by 2020 that will help grow employment in IDA companies by 30,000 by 2020. 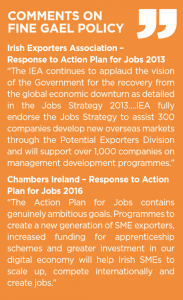 Action Plan launched by Minister Donohoe in January 2016 will target jobs growth in the sector of 30,000. Each job in the export sector supports approximately one more job across the economy so the 80,000 jobs created in the export sectors will create another 70,000 – 80,000 further jobs across the rest of the economy. If Ireland’s competitiveness rankings and cost base begin to slide as they did from 2000 onwards and we lose export market share then the balance of our jobs growth between domestic and export sectors will tip and become unsustainable. That is the constant challenge of a small open economy like Ireland. Our new €4 billion FUTURE JOBS INVESTMENT FUND will allocate at least €500 million to accelerate export led jobs growth across Ireland’s regions. Building on the success of the Government’s Regional Action Plan for Jobs, which has funding of €250 million, our new Future Jobs Investment Fund will commit €500 million of extra funding in the years ahead. This extra capital investment will help ensure that the unemployment rate falls below 7% in each region by 2020, and that no area of Ireland is left behind as we keep the recovery going. other things, to attract more multinational jobs by building additional advanced facilities in regional towns. This will follow on from the 11 advanced facilities which are currently being rolled out. ← Mental Health: Most of us endure. Most of us survive. Some of us don’t.